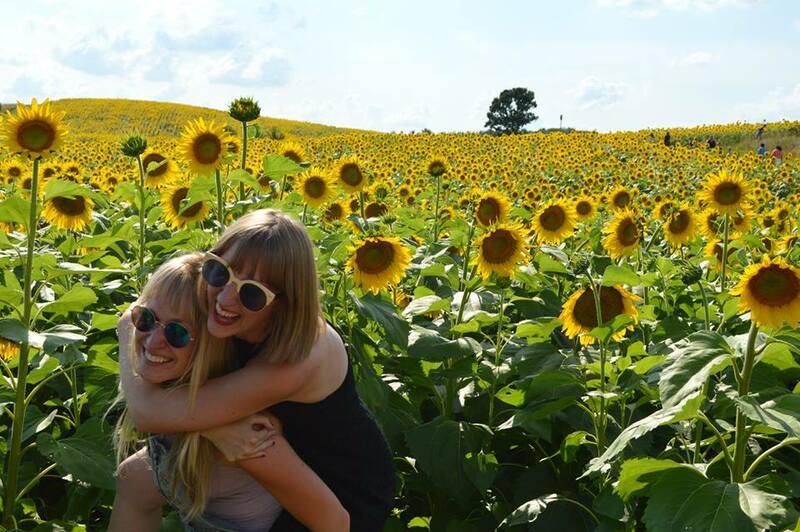 For this edition of T-Time with K, I sat down to talk with one of our favorite people we have met on Instagram: Anita from Rhubarb Paper Company. Anita owns a paper company in Canada that designs a variety of amazing greeting cards. We've devoured her cards and she's one of the sweetest and most supportive people. Recently, Anita created a new card series: Cards of Compassion. 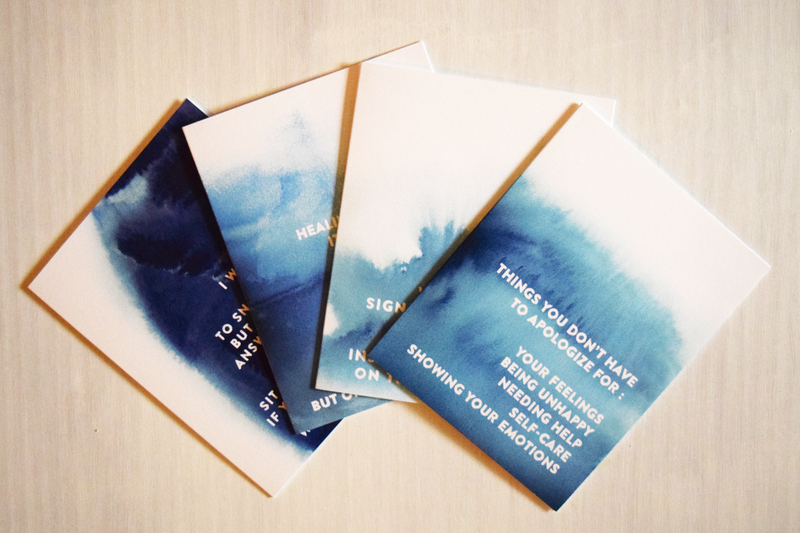 These cards were created to be positive messages of understanding to those with mental illnesses. Duck & Owl: When I first saw your idea for Cards of Compassion, I was so thrilled. How did you originally come up with this idea and concept? Why did you think that there was a need for it? 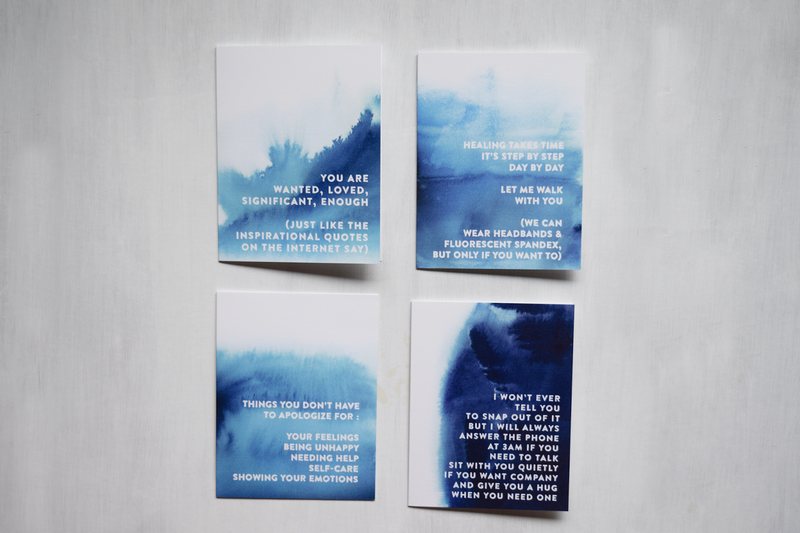 Anita: In the fall of 2014, when I began creating designs for Rhubarb Paper Co., I had an idea to create a card or a series of cards that somehow touched on mental illness and would be a form of support to people struggling with their mental health. When I was 14, my family and I moved to a new city. I became extremely depressed and without support or help, I attempted to take my own life. My depression continued through my teens and into my 20's and even after. I finally sought help (which was not a good experience). I again faced severe depression after the birth of my first son, having postpartum so badly that my husband had to take time off of work. I still struggle with depression, anxiety and obsessive compulsive disorder, but the more I learn about my triggers and how to keep my mind healthy, the easier it is to manage. The stationery world is full of cards for celebratory occasions and while that's well and good, we need to be a support to people during the difficult times too. There is still a lack of understanding when it comes to mental illness, and, truth be told, it's very difficult to grasp what a person is going through if you haven't been through it yourself. The great thing is, we don't need to understand to be compassionate. And while it might be a hard topic to bring up or discuss, a card is a great tangible way to let someone know that you get that they're dealing with hard things and you're there for them. D&O: I loved that you said, "the great thing is, we don't need to understand to be compassionate." That is brilliant and so true. I feel like I want to hang that quote up on my wall. I've also had depression my whole life and in my career as a teacher, I see students every day who struggle with being misunderstood and given a lack of empathy. It's a real problem. Why do you think there is such a huge misunderstanding regarding mental illness in our society? I can't imagine how difficult it would be to see students being treated poorly...whether by other students, faculty, parents. It would break my heart. People have a hard time understanding anything that is different from their own experiences. A lot of people also have the belief that mental illness only effects a small segment of the population, but the fact is that 1 in 5 Americans has a mental illness, so even if someone hasn't personally faced mental illness, they definitely have a friend or family member struggling with one. Also, there are so many different ways in which mental illness can be and is misrepresented - either by making light of it to the point of making fun of it, or creating a societal picture that mentally ill equals unhinged or dangerous. Education is a huge part of removing the stigma and while mental illness is being discussed more openly, there's still work to be done. D&O: I can't agree with you more regarding the negative stigma surrounding mental illness. That's one of the biggest reasons why I love these cards so much. If someone has surgery, they get a "Get Well" card. The same thing should happen if someone made it through another day with depression. You made it through another day. That should be wildly celebrated and unfortunately it's not. What are your goals for these cards? Do you think that they're a good starting point at erasing this negative stigma? If so, how? A: The simplest goal, although the most important, is to help people feel more supported. When I think back to my darkest days as a very lonely 14-year-old, a card like this would have been a reminder that yes, somebody notices that I am struggling, somebody does care. Cards are not a replacement for a discussion with a loved one or physical support, but it's a tangible item that can be given, because not all of us are great with words...it's an ice breaker, so to speak; a stepping stone to a broader conversation. The larger goal is to make people aware that mental illness impacts all of us. It's not something to be ashamed or scared of. Cards like this should be as accessible as get well, sympathy and other support cards. I hope that seeing Cards of Compassion on store shelves will be a reminder that this issue is more commonplace than we've previously been led to believe, which I hope will erase some of the stigma. Even if the cards start a dialogue about mental illness, I think that's a positive thing. D&O: Gosh, you're amazing. I love everything that you just said. Is there anything else that you would like to add? A: It's so easy to be caught up in our own day to day struggles, conflicts or even our own joys, that we fail to notice when someone we love is facing something real and difficult. Mental illness is invisible. Sometimes the signs are so subtle that we can barely notice, unless we really take the time to pay attention. When we see someone struggling, we have a duty to do something...and what that is or should be completely depends on the person's individual needs...gently ask them, "what can I do for you? what do you need?" In the least, offer an ear for whenever they need it. Everybody needs to know they have someone they can talk to. 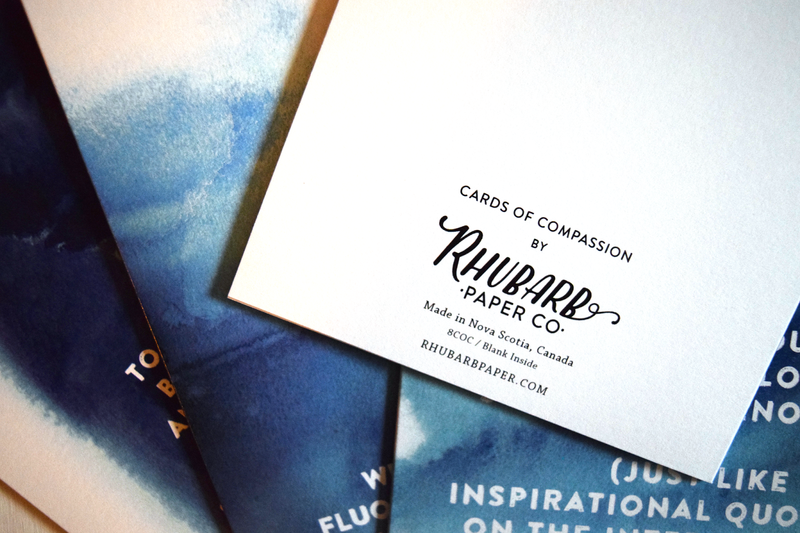 The Cards of Compassion are available now on Anita's website: Rhubarb Paper Co.